Park-and-Ride facilities serve as collection areas for people transferring to higher occupancy vehicles. They are often located and designed to serve bus or rail transit, but many are used by carpoolers and vanpoolers as well. What are some of the benefits of Park-and-Ride? Overall, the benefits of park-and-ride facilities help reduce congestion and air emissions. Most Park-and-Ride facilities are conveniently located at or near bus or rail services. For more information on these facilities, please contact the transit agencies below. 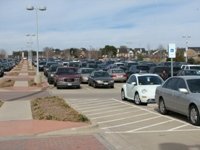 For all other park-and-ride facilities, please contact NCTCOG staff member Sonya Landrum at 817-695-9273. To view the regional Park-and-Ride facilities map and inventory, click the links below. For facilities in the Dallas area, please visit Dallas Area Rapid Transit (DART) or call (214) 979-1111. For facilities in the Fort Worth area, please visit the Fort Worth Transportation Authority (FWTA) or call (817) 215-8600.